I have been watching all kinds of good movies on AMC the past couple of days! I don't know why they are playing so many great movies, but I am loving it. Last night I saw Miracle. It's about the USA Olympic Hockey team in the 1980 Olympics. They also had on the original Miracle on 34th Street. Today, when I crawled out of bed at 11, they had on Cool Runnings. I love any movie with John Candy. I miss that guy. After that, I figured I better get started on my 7 mile run. The temperature had gotten up to about 34 degrees and that was going to be the high. I knew I would be cold so I wore some fleece lined running tights, running skirt, fleece lined turtle neck, and jacket. I decided against carrying water, but brought a couple of shot blocks just in case. I also brought some kleenex, but lost it somewhere before mile one. Grr. Kevin: What are you doing? Me: Going to go for a run. Me: You know I'm a Winter Warrior. I downloaded the app Runkeeper last night to try it out. I had heard good things about it and wanted to see what I thought. For some reason I am always looking for new apps and websites to track my runs on. I'm weird that way. I didn't know this, but when I started it up, it announces every 5 minutes the distance and pace. I'm sure this is something I can edit, but it was nice for the time being. I also wore my Garmin so I could compare data. I felt really good. I did glance at my Garmin a few times to compare the miles and pace. I actually kept making myself slow down a bit. I had to keep telling myself it's 7 miles, not 3. Just conserve your energy. I don't really remember much about the run. I think I was totally zoned out and just let my body do it's thing. At 3.6 miles I took a minute to stretch and take a shot block and a picture of the gorgeous sky. At the turn around I figured out my current pace and was at about an 11:18 minute mile. I was pretty surprised, but knew I still had a ways to go and always seem to really slow down the last bit. I told myself now just don't stop until you are almost back home. And I didn't. I did have to stop for a couple of lights, but otherwise I just ran and ran. I really pushed it the last half mile or so. Overall it was a really good run. I didn't even check out my pace or anything at the time. I just went home, showered (my shirt and jacket were completely soaked with sweat) and stretched. 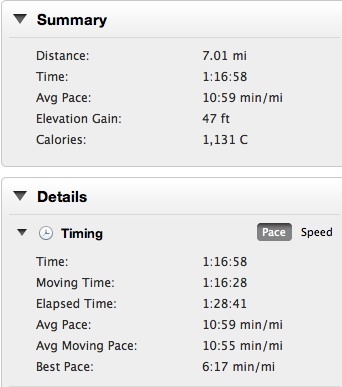 Once I uploaded my Garmin data, I almost passed out when I saw my average pace. 10:58?!?! What?? I could not believe it. I have never done that for a long run like this. Never. Ever. I know it's just an 11 mile pace, but to have a 10 in front like that is so cool to me! It just shows that I am actually getting faster. Now I am watching Jumanji. I have never seen it. It's pretty good, and Robin Williams is another actor I really like. Do you run inside or outside in the cold?